Wisdom teeth are the four permanent adult teeth situated at the back of your mouth on all corners – on the top and bottom. A dental or surgical procedure to remove any of these four teeth is referred to as wisdom teeth extraction. This procedure is conducted by an oral surgeon or dentist. If your wisdom tooth doesn’t have room to grow leading to infection, pain or other dental issues, you may need to have it removed. Before the wisdom tooth is removed, the doctor administers a local anesthetic so as to numb the area of your mouth where removal will take place. During extraction, the doctor opens up the gum tissue that is over the tooth and takes out any bone covering the tooth. Some people may need stitches after the tooth is removed – some stitches have to be removed after some time while others will dissolve over time. Bite softly on the gauze pad and change pads once they become soaked with blood. In case you are still bleeding 24 hours after the extraction, contact your dentist. While your mouth is still numb, be careful so as not to bite your tongue, or the inside of your cheek. Do not lie flat as this may prolong bleeding. On the outside of your cheek, you can try using an ice pack. In the first 24 hours, apply for about 20 minutes at a time. Relax after the extraction of the wisdom tooth as physical activity can increase bleeding. Start with soft foods and add solid foods to the diet gradually, as you heal. Use warm salt water to rinse your mouth gently, after the first day, as this relieves pain and reduces swelling. Do this several times a day. Avoid rubbing the area of extraction with your tongue. Your jaw may not have enough space for the wisdom teeth leading to them becoming impacted. The wisdom teeth may break through your gums partway, causing growth of some gum tissue over them. Food particles and germs get trapped under this gum tissue and can cause an infection. Impacted wisdom teeth can lead to more serious problems such as damage to bone or other teeth, or an infection. Tooth decay and gum disease in the wisdom area. 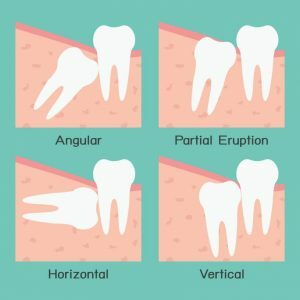 Wisdom teeth becoming impacted and unable to break through the gums. Red, painful and swollen gums caused by the flap of a gum tissue, that may grow on a wisdom tooth that has partially come in. If you are having problems with your wisdom teeth or you need professional dentistry advice, do not hesitate to check our website or contact us.